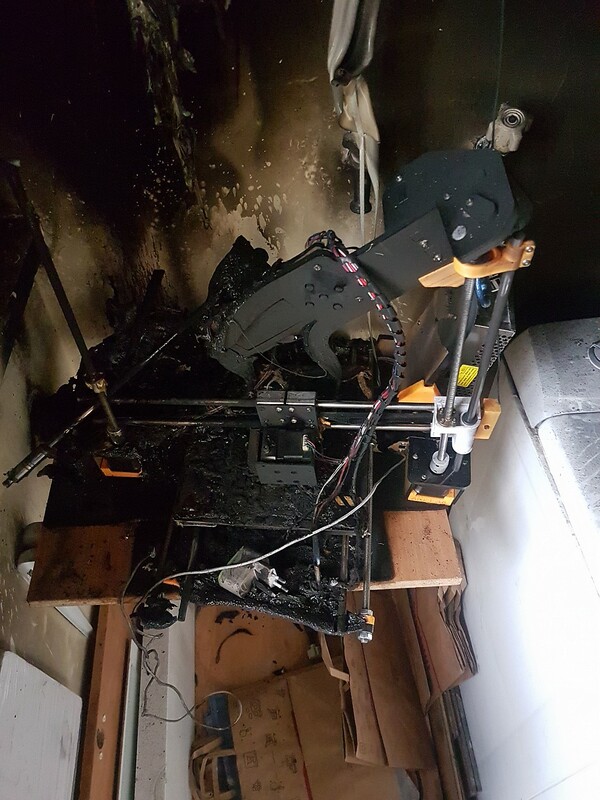 Ive been at this printer lark for 4-5yrs now and I still to this very day treat my printers as the most high risk fire hazard In my entire house, Even my own designed printers are treated like potential suicide machines that will happily explode the instant I become complacent. It infuriates me no end when I hear people blabbering on in forums about how their machine just finished a overnight print and how nice it is to be able to get out of bed in the morning to find it finished. basically saying, turn it on, start the high temperature print then bugger off to bed without a care in the world, whats worse its usually the more experienced makers using much more expensive higher spec'ed machines that often brag this sorta tripe, problem is the newcomers see them talking this cack and just assume their entry level filled with glitches Chinese clones can do exactly the same. I never leave any of my printers un-attended during operation, If I have a print thats running into the early hours I bloody well stay up and wait for it to finish even if its on one of my more capable printers that Ive designed and built with my own two hands while taking into account all the possible safety issues during the process.... you just never know when something unanticipated might occur and fire doesn't have any qualms about killing everyone in the house. the problem with diagnosing the source is the anet uses a acrylic frame, as soon as that gets hot enough it collapses in as it melts and burns and that'll pretty much destroy most evidence. Yes very true tho had it been a bed fire I would have expected the right side to have equal damage unless of course they also have the bed connector on the left side instead or the rear or front faces. IMHO, bare minimum, have a powder extinguisher at hand near your printers at all time and atleast one smoke alarm in the same room. for the cost of 20 notes it might mean the difference between a bit of smoke damage or some poor sod losing their life. When I changed the Y carriage I discovered the Malyan heated bed connection points aren't that much better designed and it concerned me enough to carefully clean the terminal area and cover it with a non-conductive adhesive film. I completed one overnight print when I was very new to the 3D printing game. I struggled to sleep due to the concern of fire. I'd placed a fireangel atom smoke detector above the printer and had the main downstairs fire alarm a few feet away alongside an electrical fire extinguisher. There was so much talk over the net of overnight prints being common place that I went against my gut, but I've not done it since and would try never to need to do it again. Thing is, some prints require 24+ hours. It's one of the reasons I'm looking into getting a new printer with the ability to pause a print and actually power down the printer until the following day. There's a few reports online of Anet A8's catching fire. Either its multiple reports of the same machine (quite a few mentions seem to be mid last year) or, for safety purposes, the A8 is a machine best steered clear of! 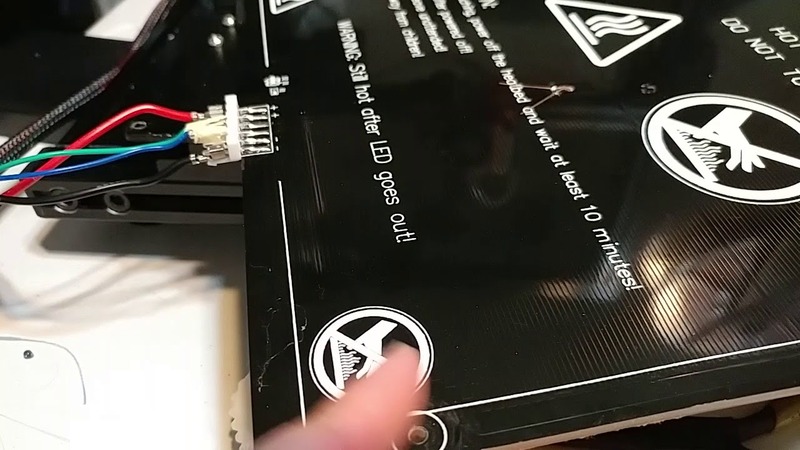 It isn't just the A8 all ANET Machines have similar problems and I suspect the reason we hear more about the A8 is that it is I believe the cheapest and therefore the most sold machine they do! aye early last year they dropped the a8's price to 99 quid and every muppet ran out and bought one, most of them never having any experience with 3d printing whatsoever, they went home, slapped it together and expected it to be PNP (they also emptied just about every ebay supplier of 1.75 filament which peeved me off no end). dont get me wrong, with a bit of time and effort to address the Anet's issues before throwing anything heavy at it print wise Im sure it'd be a reliable platform but unfortunately as I said, complete noob muppets bought them on mass without taking into account the reasons it was so cheap to begin with, I got so sick of seeing "Anet this" "Anet that" appearing on my thingiverse dashboard the weeks following the mass sale I actually left 2-3 different groups so as avoid listening to idiots whinging on about how their cheap bought printer wasnt working right, I even recall one a8 user asking how to get his heatbed over 120c because he'd heard that at that temp PLA will never warp!.... wasnt long after that I left the forementioned groups. Definitely, but the A8 seems to get the most reports of fire causing failure (not that I've conducted a study or anything! ). I can't imagine there's many more A8's out there than Wanhao i3's or Prusa's etc. It's not an exact science, but if there are more reports of A8's burning it tends to suggest the A8 is particularly prone to failure for some reason. Page created in 0.074 seconds with 41 queries.